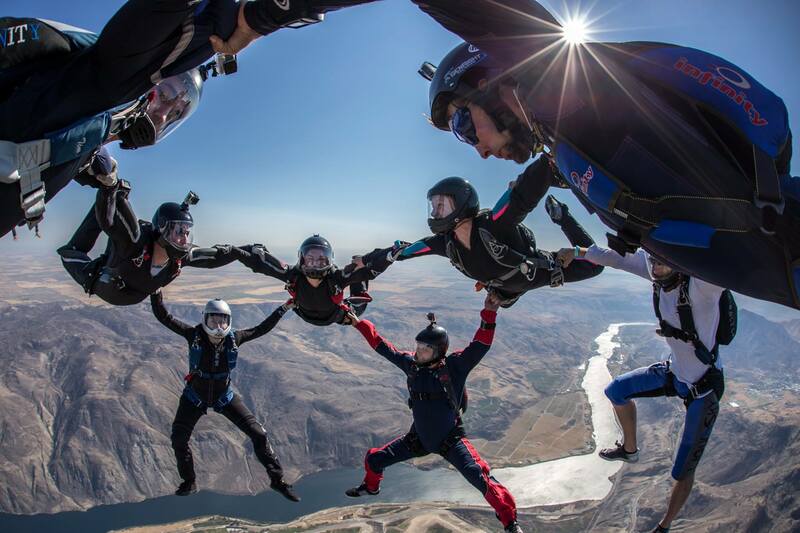 Skydive Chelan offers a view like no other! Experienced jumpers can enjoy full altitude or hop-n-pop skydives out of our fixed wing or rotor aircraft, that’s right…chopper, baby, chopper! All experienced skydivers must be current USPA Members and adhere to all USPA requirements. All A & B license holders must receive an initial canopy briefing and canopy evaluation from Skydive Chelan upon first arrival. Please call ahead for slot availability 509-881-0687. We cater to all levels of flying skills from beginner to advanced, including wingsuits and canopy piloting. Rental gear is available. Please bring current photo ID, USPA card, logbook, your in-date gear (reserve data card), and check-in with manifest to sign our waiver form. Manifest will provide an instructor for our dropzone briefing, gear check or issue rental gear. Follow us on facebook for our monthly event specials which will include Helicopter weekends, turbine aircraft weekends, sky-water-wine weekend, accuracy & swoop competitions, and more! A-LICENSE: A License holders who have not made a skydive in the preceding 60 days or more should receive refresher training and make at least one jump under the direct supervision of a USPA Instructor to demonstrate the ability to safely exercise the privileges of that license. B-LICENSE: B License holders who have not made a skydive in the preceding 90 days or more should receive refresher training and make at least one jump under the direct supervision of a USPA Instructor to demonstrate the ability to safely exercise the privileges of that license. C-LICENSE & D-LICENSE: C License and D License holders who have not made a skydive in the preceding 180 days or more should receive refresher training and make at least one jump under the direct supervision of a USPA Instructor to demonstrate the ability to safely exercise the privileges of that license. Northwest SkyFest BOOGIE is always the LAST WEEKEND (FRI-SUN) OF SEPTEMBER. FOR ALL CURRENT EVENTS: Please visit us at our Facebook page for details. Q: What aircraft do you have? A: We fly a Cessna 182 and bring in larger turbine aircraft and/or helicopters on select weekends. Q: When are the best days for licensed jumpers to come out? A: Weekends are the best days for licensed jumpers. The 1st weekend of every month we bring in a larger turbine aircraft and/or helicopter. Q: What is NW SkyFest? A: Northwest SkyFest is an annual event we host the last weekend in September in memory of our free flying friends. It is a fun event with multiple large aircraft to jump from, music, food, & open to all jumpers!